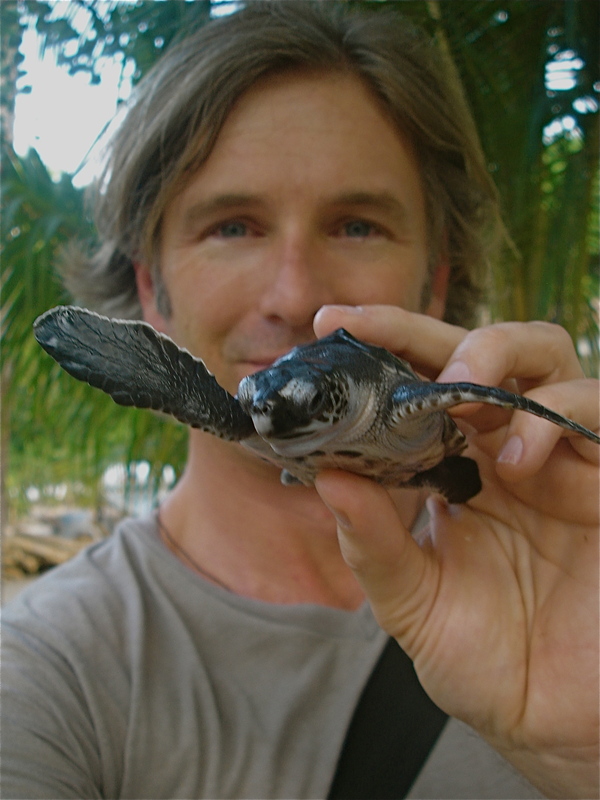 Noted ocean conservationists Fabien Cousteau and Dr. Wallace J. Nichols will visit El Salvador to launch a new fundraising project titled the "Billion Baby Turtle Project" and to kick of the 2010 sea turtle nesting season. This is the first visit of a Cousteau to El Salvador, which recently outlawed the consumption of sea turtle eggs. The trip will be in partnership with FUNZEL, a conservation organization based in El Salvador. To mark the upcoming 100th anniversary of Jacques Yves Cousteau’s birthday on June 11th, noted sea turtle biologist, Dr. Wallace “J.” Nichols, and friend-filmmaker-activist Fabien Cousteau, grandson of the famed explorer, will journey to El Salvador to announce the “Billion Baby Turtles” project. The visit will be the first ever to El Salvador by a member of the Cousteau family, whose name is synonymous with ocean protection and restoration. The “Billion Baby Turtles” project is an ambitious effort to support the release of a billion baby sea turtles at key locations around the world by the end of the decade. The project is also a key component of Fabien's new ocean conservation and restoration organization, Plant-A-Fish, also to be launched in June. Nichols and Cousteau chose to begin on the beaches of El Salvador because they are home to one of the most endangered sea turtle populations in the world, the Pacific Hawksbill turtle. Until last year, virtually 100% of the Central American nation's sea turtle eggs were collected for sale or eaten in bars and restaurants. Thanks to recently passed conservation laws and innovative public-private partnerships, that's all changed. In 2009, for the first time in decades, nearly one million baby sea turtles found their way to the ocean in El Salvador and 2010 should see a continuation of that success. The innovative approach of Billion Baby Turtles involves collaboration between former egg collectors, local non-profit organizations, government agencies, the tourism sector and international foundations around the world. According to FUNZEL, the Salvadorean partner with USAID working to coordinate the expanded sea turtle network, there are now dozens of communities, hundreds of turtle volunteers—or "tortugueros” as they like to be called—and numerous agencies and non-profit organizations committed to the recovery of Hawksbills and the three other sea turtle species known to live in El Salvador. 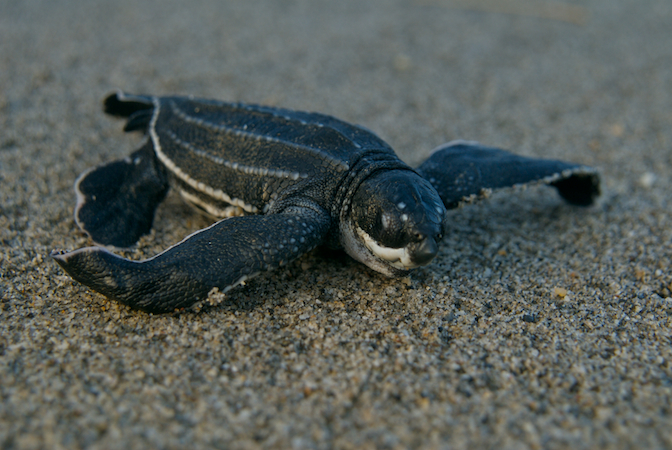 "For sea turtles to make a comeback, we need to build a diverse social movement that extends from the city to the coastal villages and promotes El Salvador as a net sea turtle protector, rather than consumer," says Nichols, a Research Associate at the California Academy of Sciences and co-founder of SEEturtles.org who is scientific advisor to the project. "Sea turtles are in many ways a symbol of the ocean crisis but also of hope for solutions," says Nichols. "By supporting the release of a billion baby sea turtles at ocean hot spots over the next decade, we'll help tilt the odds further in their favor." "The people of El Salvador have an enormous responsibility to ensure the survival of sea turtles along with protecting the ocean as it is a key source of livelihood for generations to come," says Fabien Cousteau. "What is underway in El Salvador inspires us all. This visit is my personal commitment to support their important work." According to FUNZEL/USAID sea turtle project coordinator, Enriqueta Ramirez, the team is convening a meeting of business leaders on May 6th to build and solidify long-term commitments to nesting beach projects along the entire length of El Salvador's coastline. Next up after El Salvador, Cousteau and Nichols plan to visit to the coast of Zihuatanejo, Mexico to release more baby sea turtles.